Bay City is a city in Bay County, Michigan, located near the base of the Saginaw Bay on Lake Huron. As of the 2010 census, the city's population was 34,932, and is the principal city of the Bay City Metropolitan Statistical Area, which is included in the Saginaw-Midland-Bay City Combined Statistical Area. The city, along with nearby Midland and Saginaw, form the Greater Tri-Cities region of Central Michigan, which has more recently been called the Great Lakes Bay Region. The city is geographically divided by the Saginaw River, and travel between the east and west sides of the city is made possible by four modern bascule-type drawbridges: Liberty Bridge, Veterans Memorial Bridge, Independence Bridge, and Lafayette Avenue Bridge, which allow large ships to travel easily down the river. The city is served by MBS International Airport, located in nearby Freeland, and James Clements Municipal Airport. Third Street Bridge, with Sage Mill in background, 1918. The bridge collapsed in 1976 after being hit by a freighter. Leon Tromblé is regarded as the first settler within the limits of Bay County, in an area which would become Bay City. In 1831, he built a log cabin on the east bank of the Saginaw river. Bay City was first established in 1837, and was incorporated as a city in 1865. In 1834 John B. Trudell built a log-cabin near the present corner of Seventeenth and Broadway. Trudell later purchased land that extended from his residence north along the river to what later became the location for the Industrial Brownhoist, making him the first permanent resident of what has become Bay County. Bay City became the largest community in the county and the location of the county seat of government. Most of the county's agencies and associations are located here. The city shares common borders with Essexville and the townships of Bangor, Frankenlust, Hampton, Merritt, Monitor, and Portsmouth. Bay City was originally known as "Lower Saginaw," and fell within the boundaries of Saginaw County On June 4, 1846, the Hapton, or Hampton, Post Office opened to service Lower Saginaw. The community was placed in Bay County, when the county was organized in 1857. It was at this time that the name was changed to Bay City. The Post Office changed its name to Bay City on March 22, 1858. During the latter half of the 19th century Bay City was the home of several now-closed industries including many sawmills and shipbuilders. The Defoe Shipbuilding Company, which ceased operations December 31, 1975 built destroyer escorts, guided missile destroyers, and patrol craft for the United States Navy and the Royal Australian Navy. To maintain this strong Naval heritage, the Saginaw Valley Naval Ship Museum worked through the Naval Sea Systems Command to bring the USS Edson (DD-946) to Bay City as a museum ship. It was finally delivered to its temporary home in Essexville, Michigan on August 7, 2012. Another important part of the city's industrial history is Industrial Brownhoist, which was well known for its construction of large industrial cranes. On December 10, 1977 a deadly fire claimed the lives of 10 at the Wenonah Hotel in downtown Bay City. The Wenonah Hotel was located at the corner of Center Ave and Water Street, the current site of the Delta College Planetarium. Built in 1907, the 4 story Wenonah Hotel had been converted into apartments at the time of the fire. Strong winds and cold weather hampered the efforts of the fire department. There was some controversy over the cause of the fire (arson, electrical, or grease fire) and it remains the deadliest fire in Bay County history. In September 1990, the tankship MV Jupiter was unloading gasoline at the Total Petroleum Terminal. A passing cargo ship, MV Buffalo, moving at excessive speed, created a wake that caused Jupiter to break free of its berth. A fire and explosion ensued, and one man drowned. There was considerable legal action taken, ultimately resulting in an adjudication that was subsequently appealed by the owners of Buffalo. The findings of the Court of Appeals upheld the original decision, which assigned 50% of the responsibility to Buffalo (for her excessive speed), 25% to the dock operator (for rotten wood pilings) and 25% to Jupiter (for improper procedures in unloading her cargo). On October 12, 2010 the historic 113-year-old City Hall sustained significant damage as the result of an attic fire which caused the sprinkler system to run for nearly two hours. Most of the damage to the building was water damage from the sprinkler system and water used to fight the fire. The fire started in the midst of a $1.6 million roofing project. After an investigation, it was determined that a worker was using a grinder to cut off bolts in the area where the fire started, and sparks from the work started the blaze. Fire crews were on the scene for nearly five hours fighting the hard-to-access fire. Bay City, along with Saginaw, and Midland make up the Tri-Cities Area, a sub-region of Flint/Tri-Cities. Bay City is sometimes regarded as being part of the greater Thumb of Michigan Area, which is also a sub-region of the Flint/Tri-Cities. Conn. M‑13: This short freeway was once a segment of US 23. It is now a connector freeway between I-75 and M-13. Four modern bascule bridges allow transportation across the Saginaw River, which separates the East and West sides of Bay City. Lafayette Avenue Bridge, opened in 1938, carries M-13 and M-84 over the river. The Veterans Memorial Bridge, opened in 1957, carries M-25 over the river. Independence Bridge, opened in 1976, carries Truman Parkway over the river, replacing the earlier Belinda Street Bridge (built in 1893). Liberty Bridge, opened in 1990, connects Vermont Street (on the west side of the river) and Woodside Avenue (on the east side). As of the census of 2010, there were 34,932 people, 14,436 households, and 8,546 families residing in the city. The population density was 3,434.8 inhabitants per square mile (1,326.2/km2). There were 15,923 housing units at an average density of 1,565.7 per square mile (604.5/km2). The racial makeup of the city was 89.7% White, 3.5% Black, 0.6% Native American, 0.5% Asian, 1.8% from other races, and 3.9% from two or more races. Hispanic or Latino of any race were 8.5% of the population. There were 14,436 households of which 31.7% had children under the age of 18 living with them, 37.0% were married couples living together, 16.6% had a female householder with no husband present, 5.6% had a male householder with no wife present, and 40.8% were non-families. 33.7% of all households were made up of individuals and 11.3% had someone living alone who was 65 years of age or older. The average household size was 2.38, and the average family size was 3.04. In the city, the population was spread out with 25.5% under the age of 18, 9.4% from 18 to 24, 30.5% from 25 to 44, 20.5% from 45 to 64, and 14.1% who were 65 years of age or older. The median age was 35 years. For every 100 females, there were 92.9 males. For every 100 females age 18 and over, there were 88.6 males. Bay City has a Commission-Manager form of government. The Mayor, who is elected to a four-year term, is the presiding officer of the City Commission and has the power to appoint some board and commission members, with the approval of the City Commission. The Mayor of Bay City is Kathleen Newsham, who has served in that capacity since January 2016. The City Commission has nine members, one from each of the city's nine wards. City Commissioners serve four-year terms and term limited to two consecutive terms. The terms of the Commissioners are staggered; the even-numbered wards are elected together (in years 1999, 2003, 2007, etc. ), and the odd-numbered wards are elected together (in years 2001, 2005, 2009, etc.). City operations are managed by the City Manager, who is chosen by the City Commission. Michigan Sugar is also based in Bay City. The Hell's Half Mile Film and Music Festival is held annually in September. The festival features a mix of independent films with live indie music. The Bay City Rollers, a Scottish band, was named after this city after the band randomly threw a dart at a map. The entertainer Madonna, who was born in Bay City, referred to her birthplace as "a little, smelly town in Northern Michigan" on national television. The story of Bay City's refusal to have a commemoration sign about world-famous singer-songwriter was described in a book "Madonnaland" (2016) by Alina Simone. On The Tonight Show with Jimmy Fallon, one segment, "Hashtags: #MyHomeTownIsWeird", Jimmy Fallon mentions a tweet about Bay City's Friendship Ring water monument being called the toilet seat by residents of the town. Bay City is the home to the Tri-City Ice Hawks of the United States Premier Hockey League. Bay City Public Schools operates eight elementary schools, two middle schools, and two high schools. The Wisconsin Evangelical Lutheran Synod has three grade schools in Bay City: Bethel Lutheran School (Pre-K-8), St. John's Lutheran School (Pre-K-8), and Trinity Lutheran School (Pre-K-8). Downtown Bay City – Between Madison Avenue and the Saginaw River. Johnson Street Business District – From Center Ave to Woodside St.
Lafayette/Salzburg/Kosciuszko Business District – Extends along Salzburg east to Kosciuszko (Lafayette turns into Kosciuszko). The Midland Street Historic District – Located on the West side of the city near the banks of the river. Home to many popular bars in the city. James Joseph Raby – Rear Admiral, USN. ^ Younkman, Tim (June 3, 2011). "Bay City Changed Forever The Day The Third Street Bridge Broke". Bay City Times. Citation: directoriesUSA. Michigan Business Directory, 2007/2008. 2007/2008. December 12, 2007. Variant Name Hampton Post Office Citation: Ellis, David M. Michigan Postal History, The Post Offices 1805–1986. December 12, 1993. ^ "USS Edson's Bay County arrival draws visitors from near and far for first tours". Bay City Times. August 7, 2012. ^ "Gemini Calls on Riverside Park". Retrieved May 7, 2016. ^ "WWII vet frozen to death leaves estate to hospital - CNN.com". CNN. February 4, 2009. Retrieved April 26, 2010. ^ "Bay City, Michigan Köppen Climate Classification (Weatherbase)". Weatherbase. Retrieved May 7, 2016. ^ "City of Bay City CAFR" (PDF). Archived from the original (PDF) on August 13, 2014. Retrieved October 7, 2012. ^ "Bay City, Michigan (U.S.)". Retrieved May 7, 2016. ^ "See the list of feature films screening at 2015 Hell's Half Mile fest in Bay City". MLive.com. Retrieved May 7, 2016. ^ Payne, Amy L. (February 9, 2009). "Debate brews over Madonna coffee name". The Bay City Times / mlive.com. Retrieved April 9, 2010. ^ Diamond, Jason (December 21, 2016). "'Madonnaland and Other Detours Into Fame and Fandom,' by Alina Simone: 10 Best Music Books of 2016". Rolling Stone. Archived from the original on January 4, 2017. Retrieved January 3, 2017. ^ "Buildings Directory" (PDF). Bay City Public Schools. December 2, 2013. Archived from the original (PDF) on January 4, 2014. 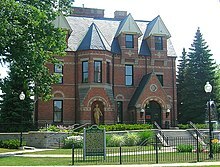 ^ "St. John's Lutheran School". ^ "Welcome to Trinity Lutheran School!". ^ "Downtown Bay City, Michigan". Retrieved May 7, 2016. ^ "Appledore Tall Ships - BaySail". Retrieved May 7, 2016. ^ "Studio 23/The Arts Center". Retrieved May 7, 2016. ^ "Welcome to the Delta College Planetarium". Retrieved May 7, 2016. ^ "Bay County Historical Society". Retrieved May 7, 2016. ^ "Jerry Leahy". Pro-Football-Reference.com. Retrieved May 7, 2016. ^ "Michigan State University's Trenton Robinson poised to become first player from Bay City taken in NFL Draft since 1973". MLive.com. Retrieved May 7, 2016. ^ "All-Time Players". Retrieved February 21, 2010. 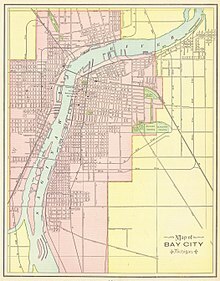 Wikimedia Commons has media related to Bay City, Michigan.